Wanda is a gorgeous pup with huge velvety ears and so much love to give… so why has no one taken her home? This beautiful pup has been waiting at the shelter for nearly half a year, desperate for a family. Normally fun-loving, shelter staff are getting concerned as she becomes more and more depressed. Wanda was taken in to the Broward County Animal Care and Adoption Center in Fort Lauderdale, Florida as a stray back in January. 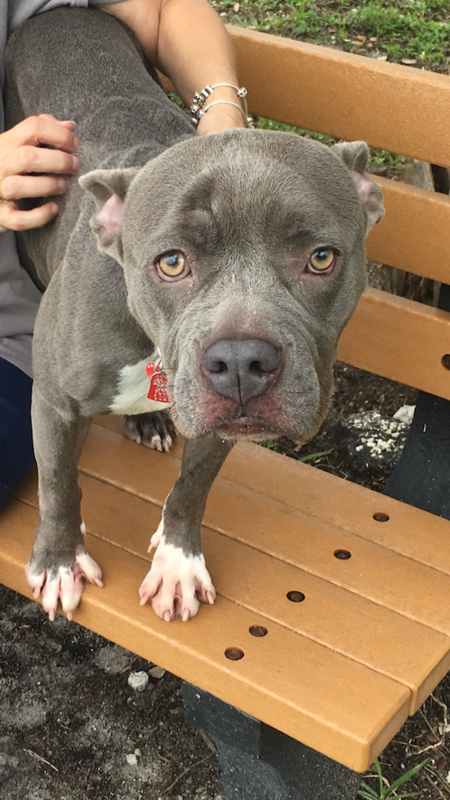 Estimated to be about 2 and a half years old, this gorgeous girl’s trademark ears have shelter staff believing that she’s a unique and show-stopping Pittie / Frenchie mix! The silver-furred sweetheart quickly became a staff and volunteer favorite once she came out of her shell. She finds joy in the simplest things, and those who’ve worked with her say that nothing makes her happier than some satisfying back scratches! Back in March, Wanda and her friends were thrilled when a family finally adopted her, but the celebration was short-lived. Sadly, she was back at the shelter after just one week — hardly enough time to decompress and settle into her new home. 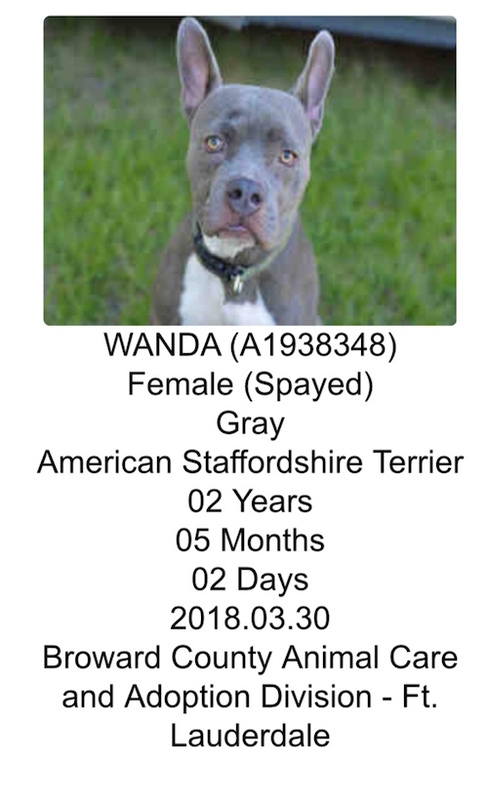 Wanda’s caretakers are working hard to get the word out about this precious gem, and Nancy Gilbert, a volunteer at the Broward County Animal Care and Adoption Center, couldn’t wait to tell us about her four-legged friend. No one is sure why this model-esque mutt hasn’t been adopted yet. One reason could be that this shy girl isn’t as outgoing with strangers as some of the other pups. It could be because she’s part Pit Bull, which carries a stigma or may not be allowed in certain condos or apartments. Maybe it’s because she’s dog-selective and a meet-and-greet with an adopter’s current pets is a must. 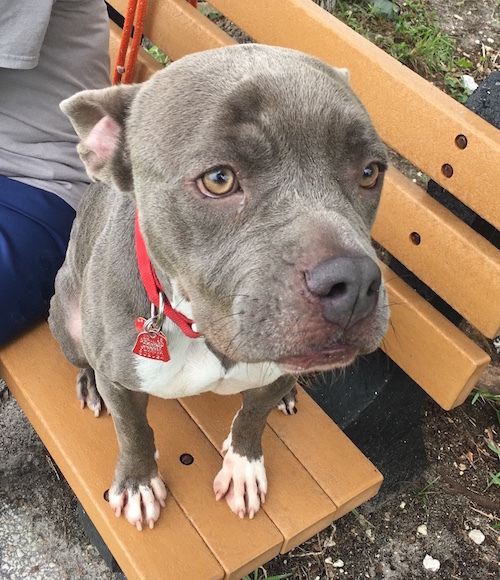 None of these seem like good enough reasons for this pup’s 5-month shelter stay, but whatever it is, one thing is for sure: all Wanda needs is a chance. Although she is loved by her caretakers, rejection and life at the shelter is starting to take a toll on Wanda. If you’ve been thinking about adopting a laid-back pooch into your family, this hazel-eyed girl could be your perfect match! You do not need to live locally to adopt her, however you do need to meet her in person. She is dog-selective, and must meet and get along with any dogs in the family before an application is approved. Wanda is thought to be about 2 and a half years old, and weighs between 45-50 pounds. She looks like a Pittie / Frenchie mix, so anyone wanting to adopt her cannot live in an apartment or condo with breed restrictions. If interested, please email Rescue@broward.org and include Wanda’s ID #A1938348. You can also print and fill out an adoption application to bring with you to the shelter by clicking here. Don’t forget to check out the other Broward County Animal Care and Adoption Pets of the Week on Facebook and Instagram. If your home is not right for Wanda, you can still help her find a forever family by sharing this story! Special thanks to volunteer Nancy Gilbert for sharing Wanda’s story, videos, and photos with us.